The Ventura is a tone shaping input device from A-Designs inspired by the electronics of the renowned Quad Eight consoles. Hand-built in the US, Ventura features three inputs – microphone, instrument and EQ/insert – which can be used together or independently. The unit is also equipped with a highly musical three-band parametric EQ as well as separate high and low pass filters. Run at optimal levels, its signal is crystal clear and ultra transparent, with all the dimensionality, air, and extended bass expected from top shelf analog hardware. Push it a little harder, and Ventura provides a more aggressive sound while still retaining full bandwidth tonal clarity. The EQ can even be accessed via its own insert for sweetening tracks during mixdown. Another noteworthy feature is the onboard high-impedance instrument DI, specifically built to enhance the performance of guitar and bass pickups. The heart of the Ventura is the C12X discrete bipolar transistor operational amplifier. Operating on +/-30V rails, the C12X is a high-gain, fast-slew, stable audio block with virtually no DC offset over the audio spectrum, and is capable of driving a 50-ohm load at 50Hz with extremely low current draw. It’s used in the microphone preamp, instrument input amp, and main output/EQ output stages. Top of the line Cinemag input and output transformers guarantee optimal performance from end to end of the signal path. The mic pre itself is a single-stage, transformer-coupled design with balanced I/O. It features phase reverse, -20 dB pad, +48V phantom power with LED indicator, and gain control. 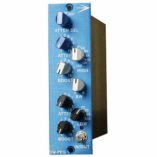 The preamp section feeds both the EQ section and a dedicated preamp output simultaneously. The Ventura’s three-band parametric equaliser is a unique design featuring thirty-three frequencies grouped into three bands of overlapping ranges from 50Hz to 15KHz. Both the frequency selection and the +/-12dB boost/cut controls are stepped for precise, easily recallable settings. Each band has a Q switch with three fixed positions: Sharp, Wide, and Normal. The low and high bands can be toggled between peak/dip and shelving duties, with the shelving switch disabling the Q feature on high and low bands only. Another set of switches engages a separate set of specially tuned 2nd order high and low pass filters, which work whether the EQ is in or out. The equaliser’s input/insert return provides direct input to the EQ, bypassing both the mic pre and instrument input. The instrument DI is separate from the mic pre. It is a single-stage, single-ended, high-impedance preamp that also sports the C12X transistor. 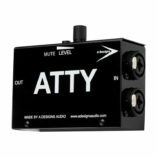 Designed specifically to counteract the undesirable effects of guitar/bass-pickup loading, it is accessed via a front-panel 1/4” jack and gain pot. This section also feeds the EQ and preamp output simultaneously. 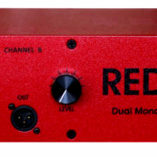 Combining transparency and sonic versatility with the flexibility to use its three sections independently, Ventura is a “desert island” preamp that will suit any and all recording applications…and even engineers who typically avoid using equalisation while tracking will find themselves looking for excuses to use its EQ. Ventura is the perfect input device to use for easily capturing and surgically sculpting any audio signal for DAWs or hardware multitrack recorders, and will quickly become a favourite go-to device in any recording or live environment. Ultra transparent, solid-state mic preamplifier with 72db gain; instrument DI; and true, 3-band parametric EQ with high-and low-pass filters. 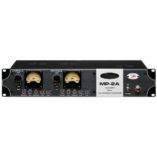 Mic preamp, EQ, and DI can be used together or independently. Three specially designed discrete C12X operational amplifiers.